Born in Sewanee, Tennessee and raised in small town Georgia, Chris Milligan began tending bar in college. After graduating with a degree in psychology and philosophy from the University of West Georgia, Chris decided he wanted to move to the culinary Mecca of Santa Fe, New Mexico, where he has lived and worked for the better part of 17 years. Chris’ 31 year career as a food and beverage professional (includes 73 years as a bartender) has led him everywhere from family to fine dining, nightclubs, adult entertainment clubs, and international chains. Working in all facets of restaurant operations, Chris focuses on training, consulting and educating others about mixology and the world of hospitality. He has trained bartenders, managers, and restaurant owners all over the Southwest, and has helped to create training material for some of the top restaurants in the country. Spending his spare time as a whitewater raft guide, playing guitar, enjoying the outdoors and reading about cocktail history, Chris continues to be an influential part of the mixology world as the creator and writer of The Santa Fe Barman blog. Chris is a sought after cocktail competition judge, and was the winner of the People’s Choice Award for the Travel Channel’s “Best of the Road” show. In 2012, Chris was honored with The New Mexico Restaurant Association’s “Employee Excellence Award” for his work and dedication to the craft of mixology and pioneering Garden-To-Glass cocktails in New Mexico, and was the winner of 2012 Pride Santa Fe’s Signature Cocktail Competition. In 2013 Chris’ drinks led Secreto Lounge to be voted Best Cocktails in The Santa Fe Reporter’s “Best Of” Reader’s Poll as well as Top 3 Bartenders in the 2016 poll. Part historian and part entertainer, Chris is a bartender of the classic style and still loves working each night behind the bar serving his guests and creating new drinks as well as contemporary interpretations of vintage cocktails. 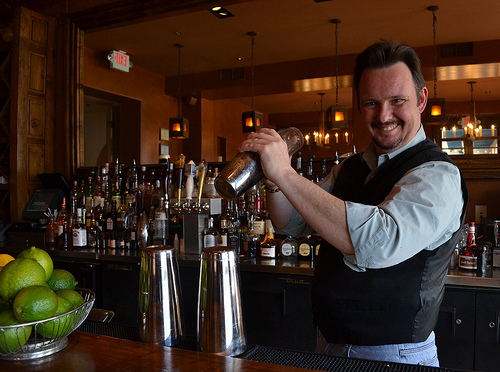 Currently, Chris Milligan is the Bar Manager & Mixologist at Secreto Lounge in the historic Hotel St. Francis in Santa Fe, New Mexico.